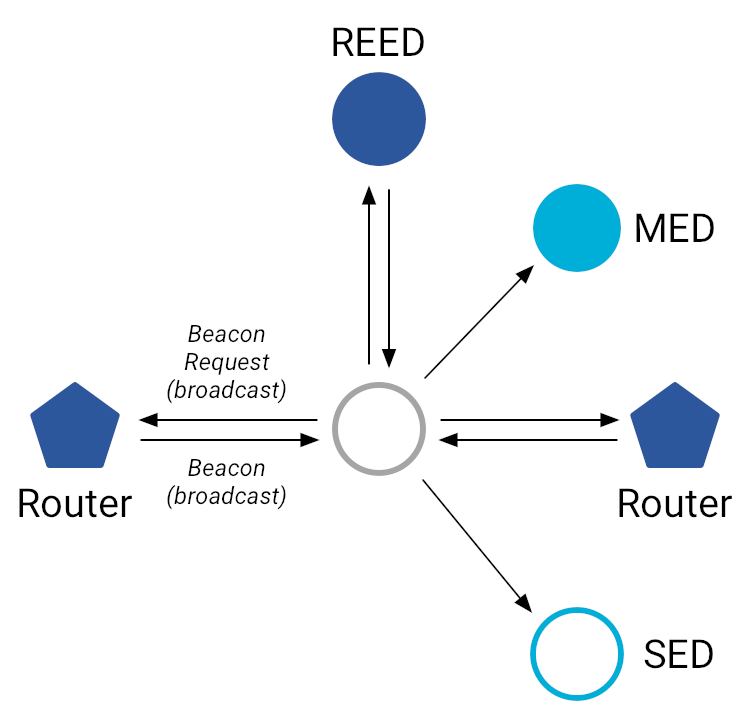 The device broadcasts an 802.15.4 Beacon Request on a specific Channel. In return, any Routers or Router Eligible End Devices (REEDs) in range broadcast a Beacon that contains their Thread network PAN ID, XPAN ID, and Network Name. The device repeats the previous two steps for each Channel. Once a Thread device has discovered all networks in range, it can either attach to an existing network, or create a new one if no networks are discovered. Thread uses the Mesh Link Establishment (MLE) protocol to configure links and disseminate information about the network to Thread devices. Route propagation in Thread works similar to the Routing Information Protocol (RIP), a distance-vector routing protocol. Note: MLE only proceeds once a Thread device has obtained Thread network credentials through Thread Commissioning. Commissioning and Security will be covered in depth later in this Primer. For now, this page assumes that the device has already been commissioned. If the device elects to create a new network, it selects the least busy Channel and a PAN ID not in use by other networks, then becomes a Router and elects itself the Leader. This device sends MLE Advertisement messages to other 802.15.4 devices to inform them of its link state, and responds to Beacon Requests by other Thread devices performing an active scan. If the device elects to join an existing network, it configures its Channel, PAN ID, XPAN ID, and Network Name to match that of the target network via Thread Commissioning, then goes through the MLE Attach process to attach as a Child (End Device). This process is used for Child-Parent links. Key Point: Every device, router-capable or not, initially attaches to a Thread network as a Child (End Device). The Child sends a multicast Parent Request to all neighboring Routers and REEDs in the target network. 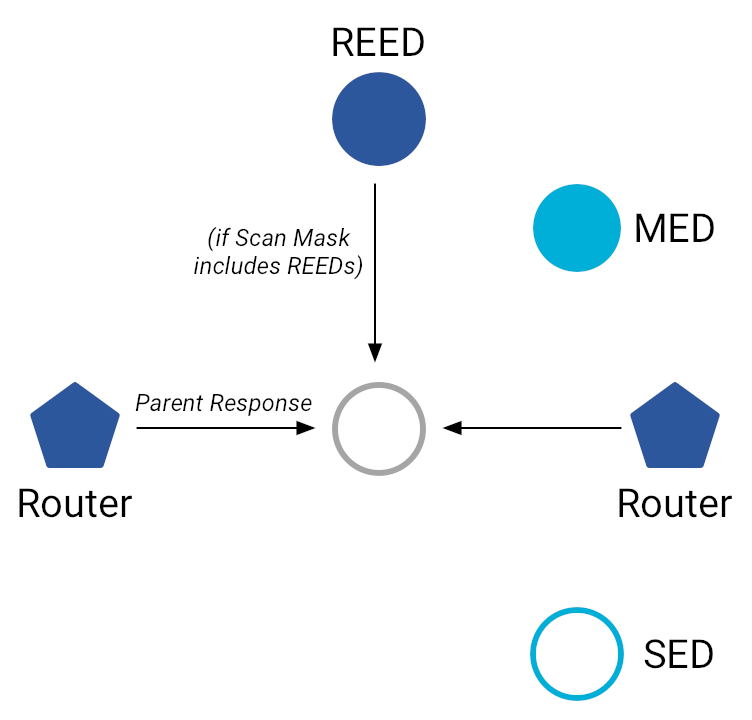 All neighboring Routers and REEDs (if the Parent Request Scan Mask includes REEDs) send Parent Responses with information about themselves. The Child chooses a Parent device and sends a Child ID Request to it. The Parent sends a Child ID Response to confirm link establishment. A Parent Request is a multicast request from the attaching device that is used to discover neighboring Routers and Router Eligible End Devices (REEDs) in the target network. A Parent Response is a unicast response to a Parent Request that provides information about a Router or REED to the attaching device. A Child ID Request is a unicast request from the attaching device (Child) that is sent to the Router or REED (Parent) for the purpose of establishing a Child-Parent link. If the request is sent to a REED, it upgrades itself to a Router before accepting the request. A Child ID Response is a unicast request from the Parent that is sent to the Child to confirm that a Child-Parent link has been established.